Bishop Roger Foys of Covington has released an apology for the Friday Jan. 19 diocesan statement condemning the actions of some Covington Catholic High School students. This concerned a publicized incident at the March for Life in Washington, DC. “This behavior is opposed to the Church’s teachings on the dignity and respect of the human person. The matter is being investigated and we will take appropriate action, up to and including expulsion,” the Jan. 19 statement said. “We know this incident also has tainted the entire witness of the March for Life and express our most sincere apologies to all those who attended the March and all those who support the pro-life movement,” it explained. However, subsequent to the release of new video that showed that the boys themselves were being verbally attacked by another group; the Bishop issued an apology. Since Saturday, 19 January 2019 the events at the Lincoln Memorial following the annual March for Life have gained international attention. 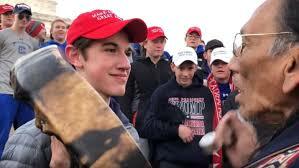 Within hours we were being pressured from all sides to make a statement regarding a video clip which purportedly showed students from Covington Catholic High School being disrespectful to Native American Elder Nathan Phillips. Based on what the video clip showed we condemned the actions of students who engaged in the alleged disrespect and promised to investigate the matter. Subsequently, there have been death threats to some of the students and their families. The vitriol and hateful comments on some online stories, some of them appearing on websites that purport to be Catholic and pro-life, have been beyond belief and anything but pro-life. We even had a bomb scare at the Curia offices and had to close the Curia and Covington Latin School (across from the Curia) in light of safety issues. 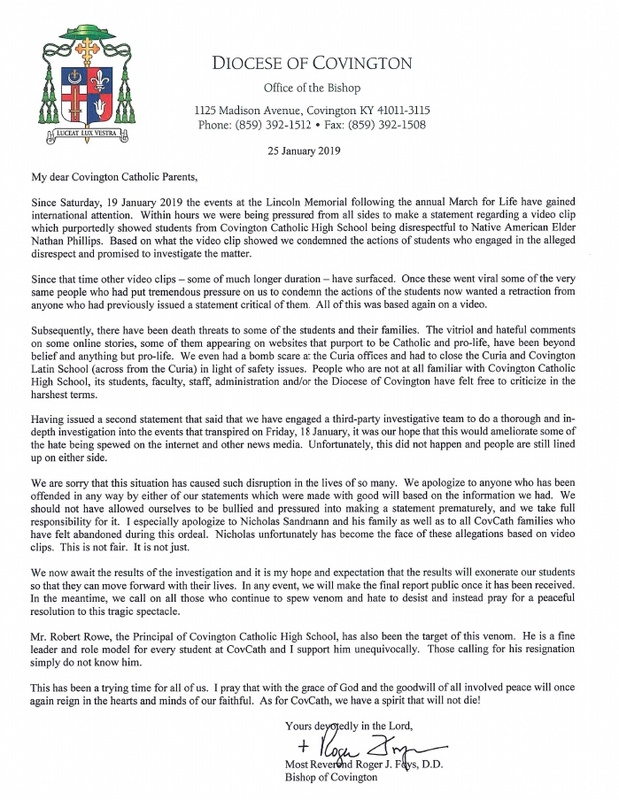 People who are not at all familiar with Covington Catholic High School, its students, faculty, staff, administration and/or the Diocese of Covington have felt free to criticize in the harshest terms. Having issued a secdon statement that said that we have engaged in a third-party investigative team to do a thorough and in-depth investigation into the events that transpired on Friday, 18 January, it was our hope that this would ameliorate some of the hate being spewed on the internet and other news media. Unfortunately, this did not happen and people are still lined up on either side. We are sorry that this situation has caused such disruption in the lives of so many. We apologize to anyone who has been offended in any way by either of our statements which were made with good will based on the information we had. We should not have allowed ourselves to be bullied and pressured into making a statement prematurely, and we take full responsibility for it. I especially apologize to Nicholas Sandmann and his family as well as to all CovCath families who have felt abandoned during this ordeal. Nicholas unfortunately has become the face of these allegations based on video clips. This is not fair. This is not just. We now await the results of the investigation and it is my hope and expectation that the results will exonerate our students so that they can move forward with their lives. In any event, we will make the final report public once it has been received. In the meantime, we call on all those who continue to spew venom and hat to desist and instead pray for a peaceful resolution to this tragic spectacle. Mr. Robert Rowe, the Principal of Covington Catholic High School, has also been the target of this venom. He is a fine leader and role model for every student at CovCath and I support him unequivocally. Those calling for his resignation simply do not know him. Most Reverend Roger J. Foys, D.D. Foys had spoken with Covington Catholic students in person, according to an article published in diocese newsletter the Messenger. “Know that I stand with you, that I join with you in that ‘Spirit that will not die’ and that together we will work through this. Thank you and God bless you,” the bishop said to the students. Covington Catholic High School students have been received death threats, and the school was closed on Monday. The Native man Nathan Phillips and a crowd of about 50 tried to disrupt Mass at the Basilica of the National Shrine of the Immaculate Conception, but were stopped by security.